This coming Friday, May 8th, PSRC presents the May Friday Nighter, “A Bike Lane This Way Goeth”. The rallymaster is yours truly, Kelly Smith. The name owes itself mainly to the fact that during the measurement this weekend, parts of the roads on the course were being used for bicycle and running events, and one of our regular rally roads has had the addition of a bike lane. You can run the rally Friday night and bike the route on Sunday, if you like. Following the lead of this year’s other rallymasters, this event will feature no course following traps. It will be a nice drive through the country on a spring evening. Last month had frogs, at this point it seems doubtful that we will see them this month. We encountered deer on the checkout. Registration for this novice oriented event opens at 6:45 PM at the Eastgate Park & Ride Parking lot in Bellevue (14200 SE Eastgate Way). The drivers meeting is at 7:10 and first car out will be 7:31. The entry fee is $20. Don’t forget that we’re running the “bring a new team and your entry is free” special. The rally finishes at Tutta Bella Neapolitan Pizzeria, 715 NW Gilman Blvd in Issaquah. Come on out and join us for a good time, and bring your friends! Come on out and join us. You’ll have a great time! 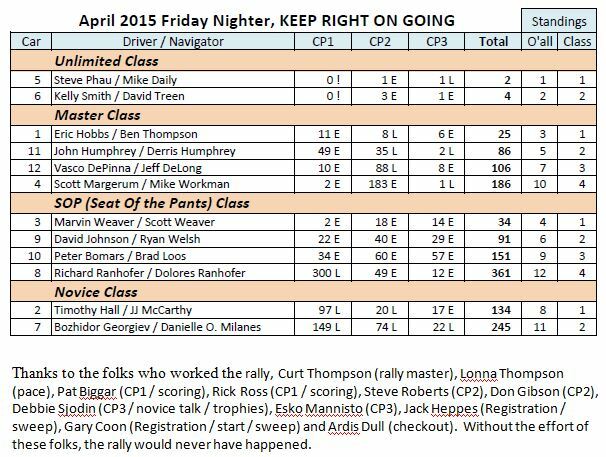 The April Friday Nighter is this coming Friday, April 10th. The rallymaster for this event is Curt Thompson. Curt is a cool guy who has been rallying for quite a while. He’s built his own rally computers but just as often runs in the Masters class, having won the SOP championship a few years ago. He likes fun events, and that is what he has in store for us this month. The rally start is at the Eastgate Park and Ride Parking lot in Bellevue (14200 SE Eastgate Way). Registration opens at 6:45 with first car out at 7:31. The entry fee is $20. Don’t forget that we’re running the “bring a new team and your entry is free” special. The rally finishes at Mod Pizza, 22833 NE 8th St in Sammamish, WA. They have great pizza! Come on out and join us for a good time, and bring your friends! Bring a team of first-timers to a Friday Nighter and help guide them through the process. Assist them with details like finding and completing a registration form. Show them official time and where to put their car number. Explain things like the starting order, the outcone, and the odometer check. Describe how they will interact with checkpoints. Cover the generic information that would be part of a Novice Talk. At the finish, answer their questions and help them complete their scorecard. Both teams (the mentors and the first-timers) need to come to the registration vehicle at the same time. The first-timers will register (using the form you helped them complete) and they’ll pay the normal $20 entry fee. Then the mentoring team registers, receiving the next (consecutive) car number and has their entry fee waived. The first-timer team must be truly new to the sport. If driver or navigator has done this before, they are not first-timers. For the mentoring team, both driver and navigator need to have rallied at least once each. You don’t need to be experts, just enthusiastic. If you are first-timers one month, you can be mentors the next month. There is no limit to how many times a mentoring team can talk advantage of this offer – just keep drawing new people into TSD rally.